Professor Kobayashi Tatsuo is Senior Advisor on archaeology to the Sainsbury Institute for the Study of Japanese Arts and Cultures. He began his career with the Agency for Cultural Affairs (Bunkacho) before returning to his alma mater, Kokugakuin University in Tokyo, where he is now Emeritus Professor in Tokyo. Closely involved with the establishment of a new generation of archaeology museums around Japan, and himself Founding (and now Honorary) Director of the Niigata Prefectural Museum of History, Professor Kobayashi is the most distinguished archaeologist of the Jomon. In 2009 he was Sotheby’s Senior Scholar at the Sainsbury Institute. Professor Kobayashi and Simon Kaner lead tour around heritage sites of France. 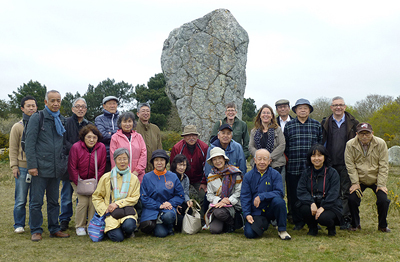 In April 2013 a group of twenty or so Japanese archaeologists, partners and friends, led by Professor Kobayashi, touched down at Norwich airport. They had come to experience some of the oldest known art in Europe, and over the next fortnight visited the Ice Age Artexhibition at the British Museum before heading to southwest France to see the Palaeolithic cave art of the Dordogne and on to Brittany to see the Neolithic monuments around the ancient town of Carnac. This was the latest in a series of such tours through which Professor Kobayashi has introduced many of his students and colleagues to British and European archaeology. During our many hours on trains and coaches, between sites and museums, I talked to Professor Kobayashi about his views on the importance of Japanese archaeology and its place at the Sainsbury Institute. We looked back on Professor Kobayashi’s many visits to Britain, which extended back to 1994 when he arrived with his wife Mitsuko to spend a year as a Visiting Scholar at the Department of Archaeology at the University of Cambridge. Prior to that Professor Kobayashi had made many trips to the United States and Canada. He had fond memories of his first stay, with Chester Chard at the University of Wisconsin, whose 1974 book Northeast Asia in Prehistory remains an important introduction to the archaeology of the region and sets the Jomon cultures in their broader context. But it was Vancouver that he really came to love returning many times over the years, and where he developed a passion for the contemporary art of the native peoples of the northwest coast of North America. Kobayashi has a profound knowledge of the anthropology of these peoples, long regarded as a rich source of analogy to assist with the interpretation of Jomon archaeology. And his interest in contemporary art has informed the way he views Jomon creativity. Many of his books are enhanced by drawings by Japanese illustrators, and Kobayashi has long been interested in the ideas developed by Okamoto Taro, Japan’s own surrealist artist, and the first person to recognise Jomon pots and figurines as art in their own right. Kobayashi is convinced of the need to explore all different ways of making Jomon archaeology accessible to modern audiences. It was following discussions with Tsude Hiroshi of Osaka University, who had spent a year in Cambridge from 1992-1993, that Kobayashi decided to see what British archaeology had to offer. The early 1990s were a turbulent time in terms of archaeological debate: journals and books full of new theoretical perspectives and methodological approaches inspired by the clash between what was called ‘processual’ or ‘New’ archaeology and the postmodern or ‘post-processual’ critique. Much of this was couched in terms that were (and remain) challenging to a non-native English reader, but Kobayashi has always relished the challenge of language. His own works are full of carefully crafted terminological concepts which helps bring the ancient past to life for modern readers. Kobayashi himself had been inspired by the analysis of prehistoric settlement patterns that has been a distinctive part of the ‘New Archaeology’of the late 1960’s, and had published an influential article on the prehistoric settlement of the Tama New Town a huge residential development area west of Tokyo in the early 1970s. While in Cambridge, Kobayashi immersed himself in the new studies, focusing on ancient monuments, especially stone circles, landscape archaeology, and archaeoastronomy. In order to take up his sabbatical in England, he had put on hold the investigation of Jomon monuments, such as the stone circles of Oyu and their relationship to mountain peaks in the surrounding landscape and to the movements of celestial bodies. Returning to Japan in 1994, he wasted no time in putting his new ideas into practice, demonstrating the alignment of Jomon monuments with the summer and winter solstices, and creating a new understanding of the structuring of the Jomon world, based on the idea of the Jomon landscape centred on the village community, building on his previous work on the Jomon seasonal calendar. Some of these ideas were introduced to a western audience for the first time in the exhibition at the Fitzwilliam Museum in Cambridge entitled Flaming Pots: art and landscape in Jomon Japan, and the subsequent publication ofJomon Reflections, an English language adaptation of his introduction to Jomon archaeology Jomonjin no Sekai(the World of Jomon People). Kobayashi is committed to ensuring that Japanese archaeology is fully represented in world archaeology, and knows that as well as promoting the discoveries of Japanese archaeology through foreign-language publications and exhibitions, Japanese archaeologists must be aware of archaeology outside Japan. 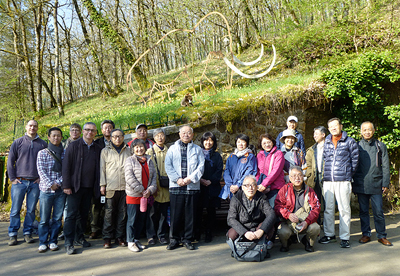 Tours such as the Palaeolithic Art Tour, and exhibitions including the Power of Dogu at the British Museum and unearthed at the Sainsbury Centre for Visual Arts, have played an important role in this, as have initiatives such as the bid for 19 Jomon sites in northern Tohoku and southern Hokkaidoto be inscribed as UNESCO World Heritage. He is particularly pleased that it was possible to get one of his beloved Flame style pots from his native Niigata prefecture into the Japanese Galleries at the British Museum in time for the London Olympics in 2012, followed by an exhibit of two more ‘Flame and Water Pots’ in the Asahi Room by the main entrance of the Museum, which proved to be the most popular exhibit from Japan yet shown in that space. Kobayashi is very concerned that good resources for studying Japanese archaeology outside Japan are very limited, and for this reason regards the development of the Japanese archaeology collections at the Lisa Sainsbury Library as of the greatest significance. With regular donations from around Japan, it is now the best resource of its kind in Europe and Kobayashi strongly believes is of the utmost importance that its future can be assured and the collections further developed.